This shawl is so long that it’s a little awkward to take photos of – I can’t imagine how big it’ll be after blocking! 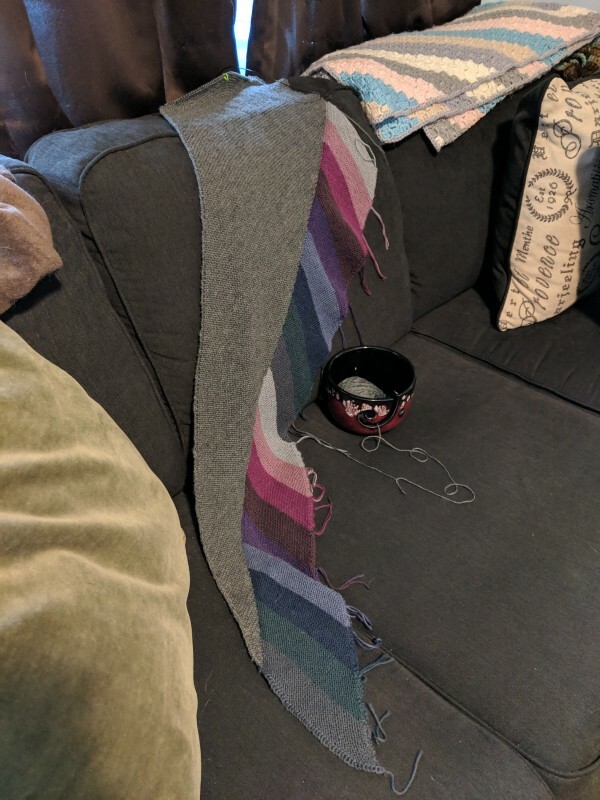 This shawl’s given me a bit of trouble as I’ve been working on it – it started off easily enough, knitting the stripe at the bottom of the shawl, but when I started picking up the stitches to knit the main body of the shawl, I ran into some trouble. The edge stitches stretched out a heck of a lot during my first attempt to pick them up, and looked really awkward when I started knitting the body. I tried a couple of different methods of picking up the edge stitches before I gave up and just picked up two loops instead of one for each edge stitch and just ran from there. 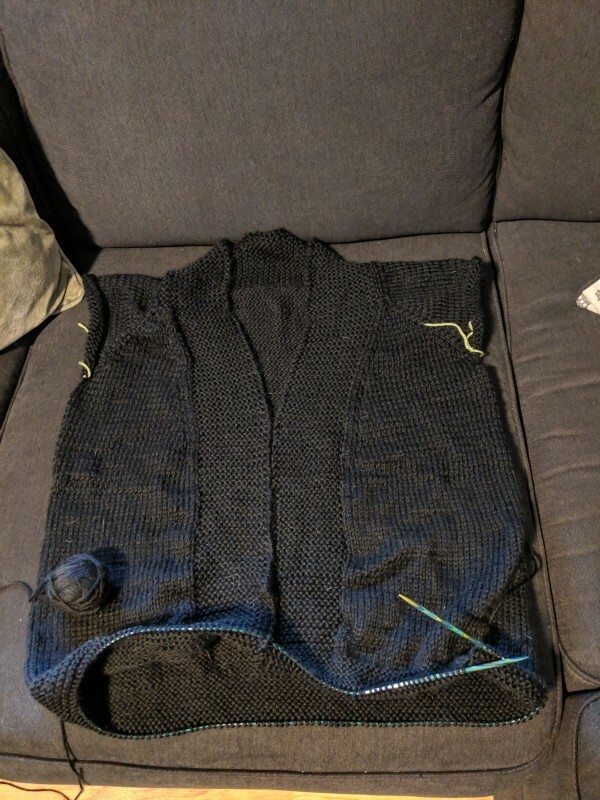 The back is a little weird as a result of my awkward stitch-pick-up method, but the front looks fine – and I’m getting pretty close to finishing it. My goal is to get this one done by the end of the month – once I finish it, then I’m going to let myself start a new project! It’s been hard, focusing solely on one project, but I really want to get this done. It’s been a while since I’ve crocheted anything, and when I ended up getting a skein of Scheepjes Whirl yarn recently, I knew I had to crochet something with it. The Secret Paths pattern had been sitting in my Ravelry library for a bit, and so I figured this would be a good project to use that skein of Scheepjes Whirl on. 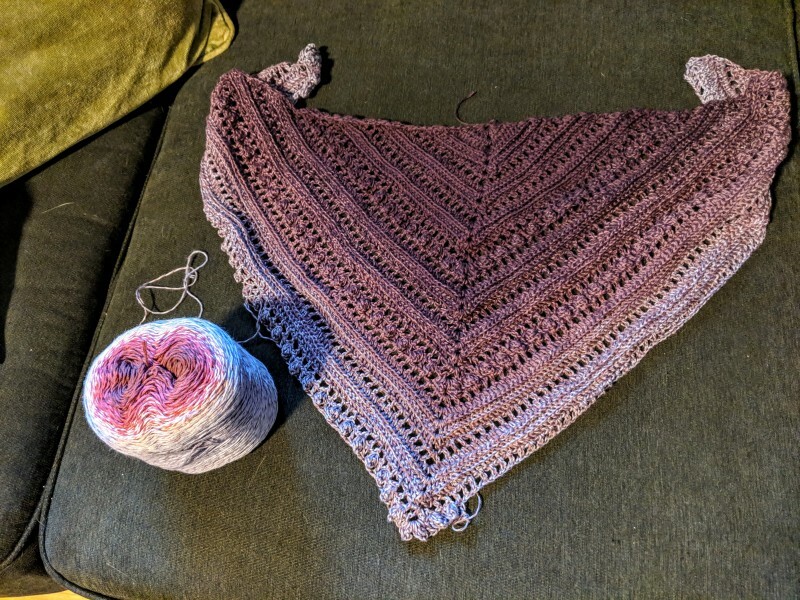 It’s been working up pretty quickly – I started it shortly after the holidays, and have been working on it on and off since then (I’ve been alternating between this one and the Russell Street shawl). It’s currently in a brief hibernation while I try to finish the Russell Street shawl, but once I finish that, I’m going to bring this back into my craft project rotation. Oh hey, it’s the Hue Shift afghan again! It’s been a bit since I’ve shared this on the blog, and I’ve made a fair bit of progress on it since then. I did a lot of work on it over the holidays, as it was pretty easy to work on while visiting with family. It’s currently hibernating as well, but once the Russell Street shawl gets finished it’ll go back into the rotation as well. I’m pretty darn close to finishing off the first quarter, which is exciting! 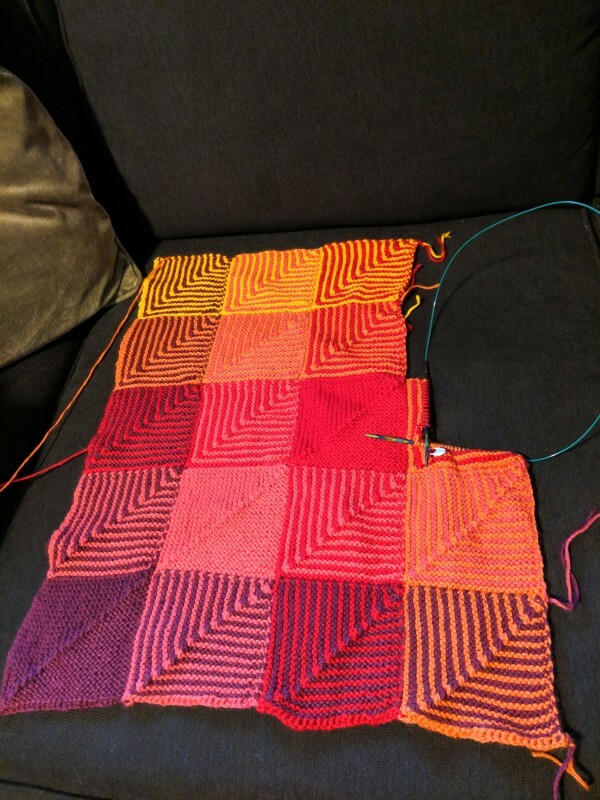 I’ve been working on this sucker for a while now – I started it early last summer, thinking I could easily finish it by fall, but nope – it’s still on my needles. I am, however, very close to done with the body. I’m maybe two inches away from finishing the bottom border, and then it’ll be time to work on the sleeves! This is the first piece of clothing (aside from socks) that I’ve knit, and I’m pretty pleased with how it’s turning out – even with the switch from accidental twisted purls to proper purl stitches. I learned I’d been doing the purl stitch wrong for years while I was working on this, heh. 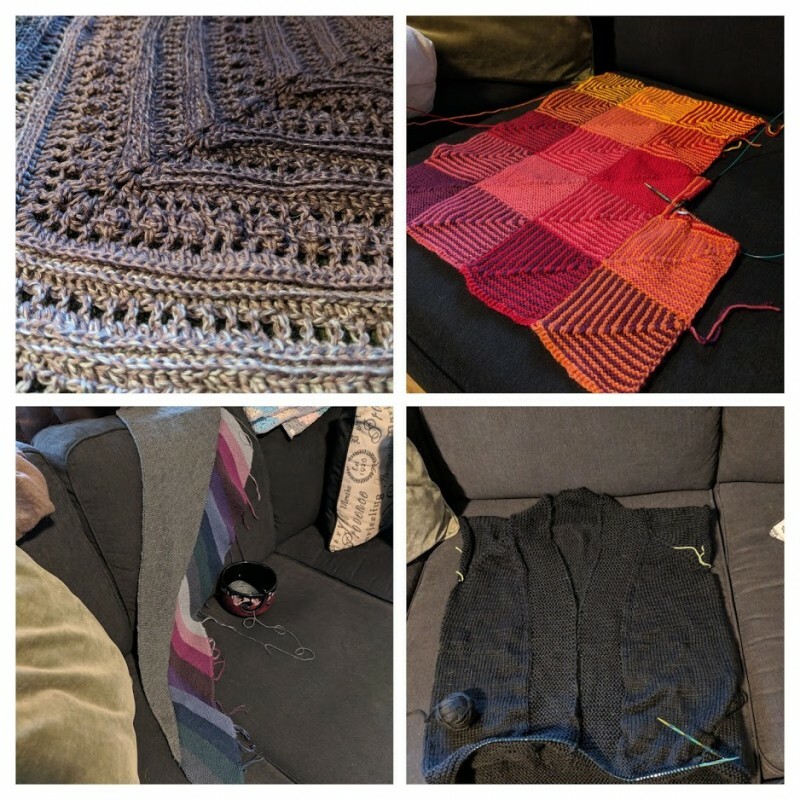 Here’s hoping I can get at least one of these projects finished soon! I always feel good when I finish a project – I just need to finish more of what I start.